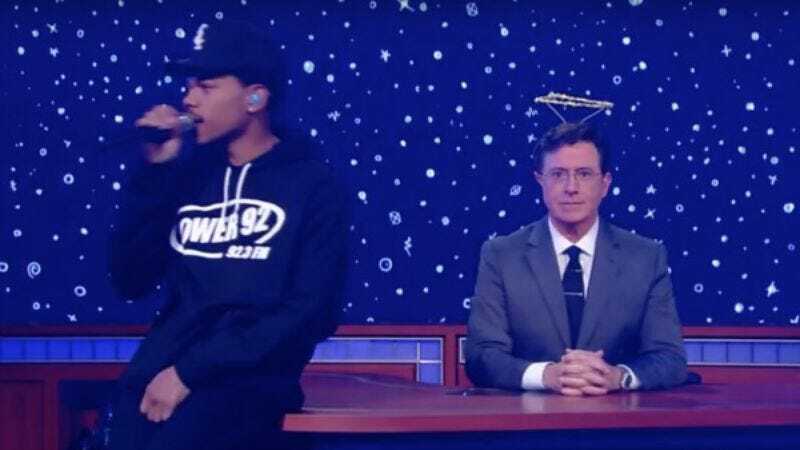 We were as surprised as anyone to learn that Chance The Rapper was collaborating with Stephen Colbert on a new song, but we weren’t shocked to see it performed on Monday night’s Late Show. That’s because, along with breaking the news of the collaboration, the rapper also shared that he’d debut the song on Colbert’s talk show. So it was that we watched Colbert interview Chance The Rapper about their project, a song titled “Angels,” which is already available on iTunes for free. The rapper’s current “business model” was the subject of some teasing from Colbert, who also jokingly admonished him for leaking the news. The Late Show host sat perfectly still in the background (wearing a halo, no less) during the performance, which included Saba and The Social Experiment. Colbert’s influence on the track is not immediately clear, though we think he might have inspired some of the fancy footwork seen. But he did say they’d made a documentary of the making of the song, so we could eventually learn exactly which verse he contributed.